Do presidents deserve 24-hour timeout? Bob Greene says a president today is like a Broadway actor who knows his performance is being reviewed line by line. Editor's note: CNN Contributor Bob Greene is a best-selling author whose books include "Late Edition: A Love Story" and "Fraternity: A Journey in Search of Five Presidents." President Obama makes a major televised address to the nation on a subject of great importance -- say, the oil disaster in the Gulf of Mexico or unrest in the Middle East. Tens of millions of Americans watch the president's speech. For the next 24 hours, there is not a word of commentary or analysis about the speech on television or on the radio. No one offers an over-the-air opinion. Sound like science fiction? Like something from an old episode of "The Twilight Zone"? It does sound impossible, in our contemporary era in which every presidential pronouncement is immediately followed by thousands of voices, on the air and on the internet, dissecting every syllable the president has uttered. But there was a time when a serious proposal was made that broadcasters voluntarily refrain from commenting on a president's speeches until the citizens of the United States were given a chance to make up their own minds. And the proposal gained considerable popular support. During President Richard Nixon's first term, his vice president, Spiro T. Agnew, went to Des Moines, Iowa, to argue his case. In so doing, he introduced a phrase -- "instant analysis"-- into the American lexicon. "When the president completed his address -- an address, incidentally, that he spent weeks in the preparation of -- his words and policies were subjected to instant analysis and querulous criticism. The audience of 70 million Americans, gathered to hear the president of the United States, was inherited by a small band of network commentators and self-appointed analysts, the majority of whom expressed, in one way or another, their hostility to what he had to say." "Every American has a right to disagree with the president of the United States, and to express publicly that disagreement. But the president of the United States has a right to communicate directly with the people who elected him, and the people of this country have the right to make up their own minds and form their own opinions about a presidential address, without having a president's words and thoughts characterized through the prejudices of hostile critics before they can even be digested." Is there something to be said, purely in theory (because in practice today it could never happen), for giving a president -- any president -- some overnight breathing room while citizens reflect individually on his words? Might Agnew's proposal have caught on? Might televised instant analysis have been done away with? You wouldn't think so -- the panels of commentators evaluating a president's words the second he says goodnight to the nation have become a taken-for-granted part of the political process. 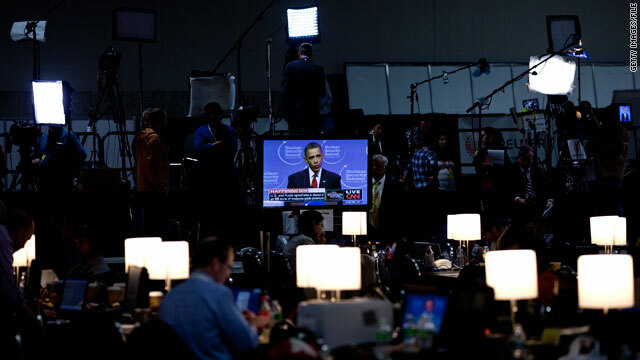 And when Agnew delivered his Des Moines speech, there were no 24-hour cable news networks, and there was no internet. The instant-commentary horse has long since galloped away from the barn. "In the middle of [the Watergate] maelstrom, the chairman of CBS, William S. Paley, dropped a bomb. Henceforth, all CBS News correspondents were forbidden from engaging in what Vice President Agnew had disparagingly called 'instant analysis.' ...[Paley] had bought into the argument of the Washington bureau's most distinguished journalist, Eric Sevareid, who thought it not fair for us to jump on a president before we and the public had had time to digest his remarks. He believed a president was entitled to a 24-hour fire-free zone." In Mudd's telling, the ban didn't last long; soon enough, instant analysis returned. And in today's world, where instant analysis is a way of life not just in presidential politics but in everyday discourse (What are all the people tapping away at the keyboards of their mobile devices doing, if not engaging in instant analysis? ), the idea that it could ever have been banished seems quaint: a historical curiosity. Indeed, those panels of cable TV political analysts, as ubiquitous as they seem, are at least several beats behind the instant analysis that the public is doing on its own. The TV commentators may be ready to weigh in with their thoughts the moment a president completes his speech -- but they have been beaten to the punch by the people at home with their eyes on the television screen and their fingers on the keyboard, sending out internet commentary on the president's speech sentence by sentence. A president today is like an actor in a Broadway play who knows his performance is being reviewed line by line to a worldwide reading audience even while he is still onstage. By the time the actor has taken his bows, the critics have already had their say. Instant, for better or for worse, has never been quite so instantaneous.